TRENDnet's TEW-827DRU AC2600 StreamBoost WiFi Gaming Router with MU-MIMO is the fifth QCA-based 4x4 router with working MU-MIMO we've reviewed. All have been AC2600 class, except for NETGEAR's R7500v2, which switched its 5 GHz radio from Quantenna to QCA, but kept the same 3x3 N radio for 2.4 GHz to remain an AC2350 / 2400 class product. The front panel, shown below, has a nice complement of LED indicators. The Power/WPS LED is a dual function indicator, flashing during WPS negotiation. Both the LAN and WAN ports shows link status and data activity (or disconnected), but don't show link speed. There are separate LEDs for the 2.4 GHz and 5 GHz bands. Finally, there is a single USB LED to show USB device connection and activity. The rear panel has the normal complement of four Gigabit LAN ports and a color-coded yellow Gigabit WAN port. None of the Ethernet ports have link speed indicators. Also worth of note, there's a switch that will turn off the front panel LEDs and another switch to disable both the 2.4 GHz and 5 GHz radios. Two of the removable antennas (RP-SMA connected) are located on the rear panel; one additional antenna is on both the left and right side of the router. There are mounting screw slots on the bottom panel. The image below shows the case open with the main board with all heatsinks in place. The two RF modules are on the left side of the board and processor and RAM is on the right. This image shows the board top with the heatsinks and RF shields removed from both RF cans. This image, drawn from the FCC ID photos, is a closer picture of the radio sections with heatsink and RF shields removed. The 5 GHz module is on the left and the 2.4 GHz is on the right. Note the four power amps arranged adjacent to the radio modules in each compartment. Here are the Amped (top) and Linksys (center) board top shots for comparison. The components used may be similar, but these are three very different board designs, with TP-LINK being the only one with the radios on the bottom of the board (bottom). 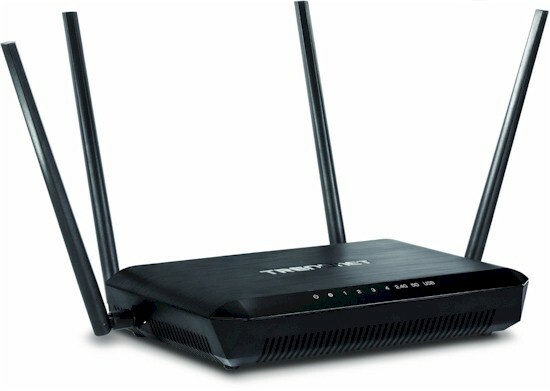 Key components for the TRENDnet, TP-LINK, Linksys and Amped Wireless AC2600 routers are summarized and compared in Table 1. Component-wise, the four are the same except for Amped's choice of QCA9990 radio vs. the QCA9980 used in the TP-LINK and Linksys designs. QCA describes the 9980 as aimed at router and gateway designs while the 9990 is for enterprise access points.